What is a Home Energy Rating Index? 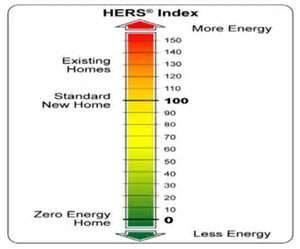 A Home Energy Rating System (HERS) provides a standard measurement of a home’s energy efficiency. Ratings are used for both and new and existing homes. In new homes a rating is often used to verify energy performance for the EPA ENERGY STAR™ program, energy efficient mortgages, and energy code compliance. Homeowners who want to upgrade the home’s energy efficiency can use the energy rating to evaluate and pinpoint specific, cost-effective improvements as well as provide support documentation for energy improvement mortgages. For existing homes, homeowners can receive a report listing cost-effective options for improving the home’s energy rating. A Home Energy Rating allows a homebuyer to easily compare the energy performance of the homes being considered. For more information, read our HERS information page. What are some “TIPS” that I can use to make my house more energy efficient? Turn down the furnace thermostat. You can save as much as $3-$5 per month by simply turning down the thermostat one degree, and another $15-$25 by setting it back 5 degrees at night or when no one is at home. Installing a set-back thermostat will do this automatically. Remember, keeping your furnace clean and in good repair will ensure that it runs to peak efficiency. It is good practice to change your furnace filter monthly during the heating season. Turn down the water heater thermostat. Most people have their water heaters turned up way too high (160 degrees), 120 degrees (the low setting for gas water heaters) is high enough to meet your hot water needs. Wrapping your water heater and inlet and outlet pipes with additional insulation will decrease heat loss and pay for itself in less than one year. Use low wattage task lighting where illumination is needed only for a small area, such as a favorite reading chair. Consider replacing frequently used high wattage bulbs with compact fluorescent light that last ten times as long as incandescent bulbs. Install low-flow shower-heads. Typically a standard shower-head allows more water flow than is needed. Installing a low-flow shower-head can save you close to 10 gallons during a five minute shower. Caulk, weather-strip, and foam to seal air leaks. Even though you may have a furnace and an air conditioner that run at or above standard efficiency, losing all that conditioned air through leaks in your house is truly “conditioning the great outdoors”. Pay special attention to the areas around windows and doors, where pipes enter walls, around light switch and outlet boxes (foam gaskets work best), and anywhere two materials meet. Caulk the interior of wall cracks, not the exterior. Use rope caulk around very leaky windows. Weather-strip your attic access hatch to prevent conditioned air from escaping. Seal your exposed air ducts with mastic or metal butyl tape and wrap them with insulation. Close your fireplace damper when it is not in use. Don’t ever start a fire and turn up the furnace thermostat at the same time! If you rarely or never use your fireplace, consider covering the opening with cardboard or some other type of material to decrease loss of conditioned air. Repair or replace windows. When repairing windows, don’t seal cracks in the glass, replace the whole pane. Make sure your windows shut tight and fit properly. Windows are expensive to replace, if you are considering replacing all or a large portion of your windows, make sure it will be a cost effective upgrade. Make sure walls, attics, and floors are filled with adequate insulation. Too often existing homes have little or no insulation in the walls and attics. Removing switch plates or outlet covers on outside walls and paying a visit to your attic can help you determine how much insulation you have working for you during those cold winters and hot summers. Attic insulation should be at an R-30 or greater level for a cold climate. The type of insulation you have in your attic determines the thickness and R value present. An insulation specialist can help you determine if it is necessary to add to your attic insulation. The R value of the insulation in your walls is harder to determine and difficult to increase. With typical 2 x 4 construction, you should have at least an R-11 in your walls. If your walls have no insulation and there is space to add it, consider having insulation blown-in. This will help to keep the conditioned air in and your energy bills down. Make sure that it is a cost effective improvement. If you have an unfinished basement or crawlspace, adding insulation to the ceiling (floor joist) will work to ensure that you are not allowing heat to travel to this area. Heat only the areas that you want to heat and not the unconditioned parts of your home. Wash only full loads of clothes and dishes, but do not overload or oversuds. Wash clothes in cold or warm water and rinse in cold. Always remember to vent your clothes dryer to the outside. Keep your freezer full, even if only with containers of water, to keep it operating at peak efficiency. If you have a second freezer or refrigerator, be aware that it may be costing you more than $20 per month. Remember to vacuum the condenser coils on your refrigerator or freezer every three months. Also, replace your refrigerator door seal when it becomes worn. To keep your freezer running efficiently, defrost it whenever the ice inside gets to be a quarter inch thick. Use small cooking appliances like microwaves, frying pans, and crock pots. Save the big appliances for the big jobs. The most important thing you can do to increase your home’s energy efficiency is to determine what your needs are, make a plan, and do it! You may not do everything at once, but each improvement will add to your comfort and increase your savings! Why Have an Energy Efficient Home? Utility expenses are one of the largest costs of home ownership after the mortgage. Energy efficient homes save money on utility bills and provide greater comfort. An EEM allows the home buyer to finance 100% of the energy improvements. Works best when a Home Energy Rating System documents the relative efficiency the home. FHA allows home buyers to finance the energy efficiency of a new home above its appraised value when the home energy rating documents of the home exceeds the Current Energy Code in place in that area. Through this program, home buyers can purchase homes whose prices exceed FHA limits. Help more lower and middle class families achieve the dream of home ownership. Purchase higher quality and more affordable housing. Create a market demand and value for energy efficient homes. Catapult new construction standards above minimum energy codes. The Buyer of an Energy Efficient Home Can Get a Bigger Mortgage Loan and More Easily Afford a Dream Home! What is an Energy Improvement Mortgage (EIM)? Energy Efficient Mortgages finance cost-effective energy improvements at the time of sale or refinancing. A home energy rater inspects the home and recommends cost-effective improvements. The funds for the improvements are placed into an escrow by the lending institution. A post-improvement rating is performed to confirm the improvements were installed. The lending institution then releases the escrow funds to pay for materials and contracted labor. The FHA and VA Energy Improvement Mortgage programs can finance improvements above the appraised value, if the measures are shown to be economical. Upgrade the homes they are buying immediately without tapping the family’s savings or taking out a higher interest, home improvement loan. Own a more comfortable home that costs less to heat and cool. Net a better return when selling because of the higher resale value. Who Do I Contact to Set up an Appointment for a Rating? All of the Energy Rated Homes of Utah (ERHU) certified Home Energy Raters are independent contractors. A current list may be obtained by contacting ERHU directly. Please be sure to contact all of the raters in your area for price quotes since prices may vary. Also, ask them for references. A blower door test is performed as part of the Home Energy Rating. It pinpoints areas of air leakage that cannot be seen otherwise.